The APC40 mkII incorporates five years of user feedback into its design. Almost every aspect of the original APC40 has been deliberated, reworked, and improved to provide extended controller functionality, countless musical capabilities, and a smarter workflow. In addition to its sleek look, veteran APC40 users will immediately notice the enhancements that include an RGB clip-launching grid, reinforced fader design, revised knob lay out, and much more. In this article we answer a few of your top questions about the APC40 mkII. Is Ableton Live 9 required? Can I use Ableton Live 8? What are the secondary functions with the Shift button? 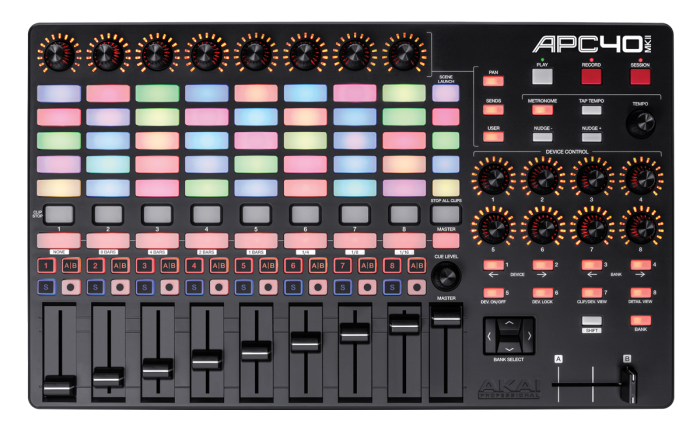 The APC40 mkII includes Ableton Live Lite 9 with PureMagnetik Effects Racks, Hybrid 3, SONiVOX Twist, Prime Loops sample packs, and Toolroom Records artist launch packs. Ableton Live lite can be downloaded from https://www.ableton.com/en/products/live-lite/. All of the additional software and samples can be downloaded from your user account upon registering the the product. Is Ableton Live 9 required? Or can I use Ableton Live 8? The APC40 mkII is supported on Ableton Live 9.1.3 or later for correct operation. The included Ableton Live Lite 9 Akai Edition is supported and functions as expected. However, he APC40 mkII can be manually MIDI mapped for use with earlier versions of Ableton Live. The APC40 mkII is powered by the included USB cable, and does not require an additional power supply. The APC40 mkII is class compliant, and does not require any drivers. Since the APC 40 mkII is class compliant it is immediately compatible with all current Windows, and Mac operating systems. The pads on the APC 40 mkII are intended for launching clips, and are not velocity sensitive. However, they can be used to trigger drums, and sounds as well.